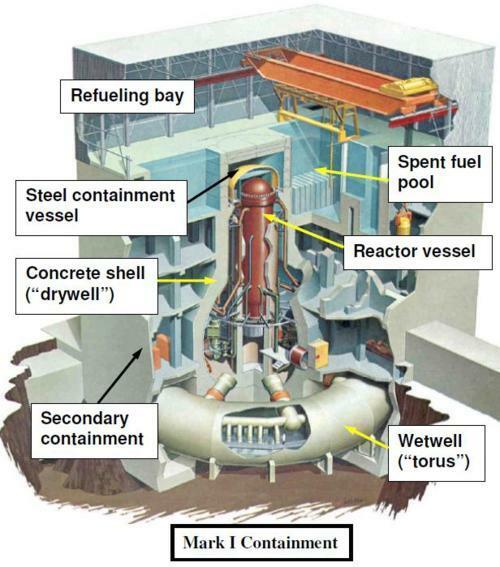 On May 22, 1986, the reactor at the Vermont Yankee nuclear plant was shut down for refueling. To refuel this reactor, a cavity above the reactor is filled with water and then a gate between that cavity and the spent fuel pool is removed. This allows fuel to be moved between the reactor core and the spent fuel pool while keeping the fuel rods under water at all times. (See Figure 1). With what the NRC artfully characterized as “less control room attention than necessary,” workers increased the water level in the reactor cavity and spent fuel pool to the point that it overflowed into the ventilation ductwork.The ventilation ducting was located a few inches above the water level in the reactor cavity and spent fuel pool in order to direct air flow across the surface of the water to sweep away radioactive gases bubbling up from the irradiated fuel assemblies. Figure 2 shows the location of the ventilation ducts relative to normal water level in the spent fuel pool. 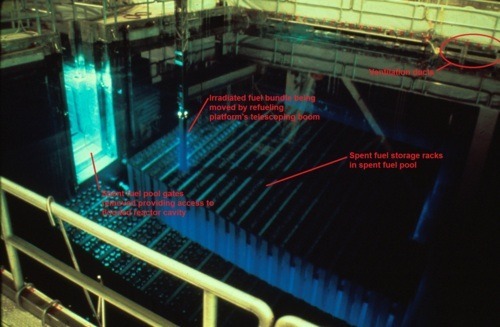 In response to flooding the ventilation system the operators at Vermont Yankee used the residual heat removal (RHR) system in “shutdown cooling mode” to drain water from the reactor cavity (and hence the spent fuel pool since the gates had been removed to connect these two volumes) into the wetwell. This quickly lowered the water level in the reactor cavity. However, it is a use of the RHR that General Electric specifically cautions against for safety reasons. The shutdown cooling mode uses the RHR pump to draw water from the reactor vessel, send it through heat exchangers to cool it down, and then return it to the reactor vessel. At Vermont Yankee, operators diverted some of the return flow from the reactor vessel to the wetwell. General Electric, the reactor’s designer, warns against this diversion because a single operator error or equipment failure can allow the reactor vessel water to quickly drain. Emptying the reactor vessel of water when it contains highly radioactive fuel assemblies is a very bad thing to do. The RHR system is very versatile. It can take water from the spent fuel pool, cool it, and return it to the spent fuel pool. It can take water from the wetwell, cool it, and return it to the spent fuel pool. It can take water from the reactor vessel, cool it, and return it to the reactor vessel. During accidents, it can take water from the wetwell and deliver it to the reactor vessel to compensate for water being lost through a broken pipe. It can also take water from the wetwell and spray it inside containment to lower the containment’s temperature and pressure. There are detailed procedures to guide the operators through the steps needed to initiate and terminate these various modes of RHR operation. A not-so-subtle clue for the operators at Vermont Yankee that what they wanted to do was wrong should have been the lack of a procedure guiding them to using RHR to return some water here and some water there. The RHR procedures aren’t mix and match that allow hybrid modes of RHR operation to be created as needed by cutting a few steps from this section and pasting a few steps from that section until you get the lineup of steps you want. Improvisation might work well during jazz recitals but it generally fares poorly in control rooms.